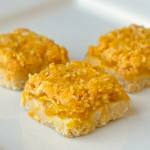 Orange Pineapple Crumble Bars - so scrumptious! 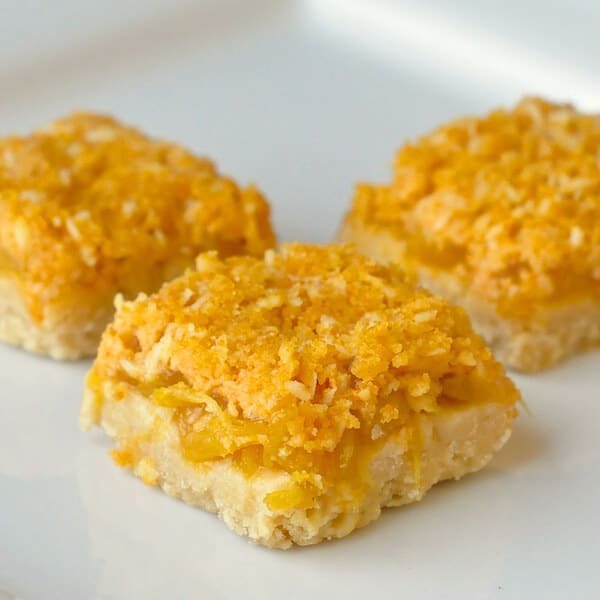 Orange Pineapple Crumble Bars – a brown butter shortbread base filled with afresh pineapple and orange compote then topped with a coconut graham crumb crumble. Simply scrumptious! 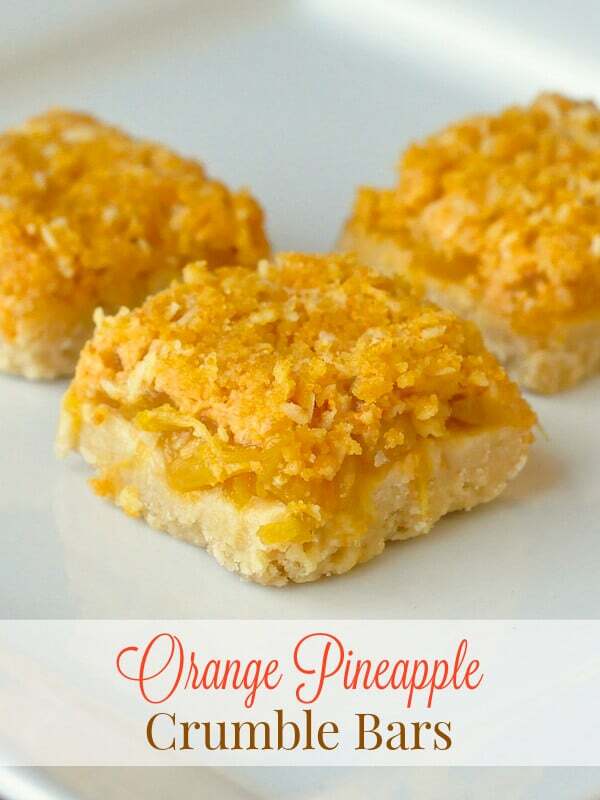 A quickly ripening fresh golden pineapple sitting on the counter top was the inspiration for these very flavourful orange pineapple crumble cookie bars. The orange pineapple combo was inspired by one of my favourite ice cream flavours as a child growing up here in Newfoundland. Do they have orange pineapple ice cream anywhere else? The result of this successful experiment was utterly delicious and I must admit, I just ate two for breakfast! Orange Pineapple Crumble Bars - a brown butter shortbread base filled with afresh pineapple and orange compote then topped with a coconut graham crumb crumble. Simply scrumptious! Crumble together the flour, butter and brown sugar with your hands or pulse together in a food processor until the butter is fully incorporated. Press into 9x9 inch pan, lined with parchment paper. Bake at 350 degrees for 10 minutes. Mix together the1 rounded tablespoon corn starch with about an ounce of water. Pour into the gently boiling pineapple mixture and cook for an additional minute stirring constantly until thickened. Cool for about 15 minutes, then pour onto the baked base. Mix together the graham crumbs, sugar, butter, flour and coconut. Sprinkle topping over filling. Bake at 350 degrees for 25- 30 minutes until golden brown on top. Cool completely before cutting into bars or squares. Fantàstique j’adore sa dois êtré un vrai délice! Gonna try these today .. orange pineapple was and still is my fav ice cream.. I live in Edmonton and have never seen it here .. but am sure to have it least 2-3 times when I go home every summer! !